Continuous Positive Airway Pressure (CPAP) Blowers are the generally accepted method of overcoming Obstructive Sleep Apnea (OSA). 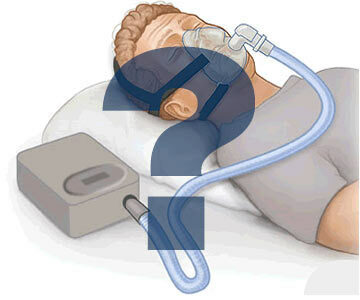 A nasal CPAP unit delivers lightly pressurised air through a small nasal mask, and this flow of air acts like an ‘air splint’ to keep the upper airway open and thus prevent apneas from occuring. Almost immediate relief of the symptoms of OSA occurs with the use of nasal CPAP and patients often report that there is a dramatic increase of daytime alertness and energy after just a few nights treatment. Hypertension is often dramatically decreased thus enabling medications to be lowered or stopped. Nasal CPAP is only available with your Practitioner’s recommendation. Initiating treatment requires careful monitoring and adjusting by a qualified sleep professional. CPAP nasal treatment is for the long-term and mask fit and comfort has been found to be a significant factor in whether patients continue their treatment, or whether the whole ensemble ends up under the bed! Literature concerning CPAPs that is distributed by MRC Healthcare, Inc., including this brochure, is offered for information purposes only and should not be considered a substitute for the advice of a healthcare provider.